Extremely Flexible: It can with stand 100,000 flexes. Hard wearing & high colour coverage. Soft, delicate & natural look & feel. 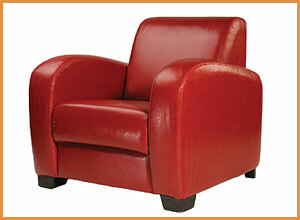 Available in 16 standard colours or one of over 10,000 colours in our database. 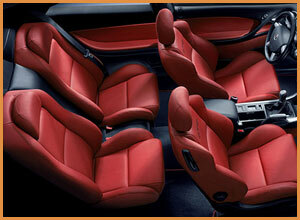 Colour matching service to match your leather exactly. 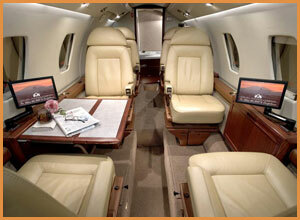 The polyurethane Leather Colourants are water based and so are non-harmful and non-hazardous. 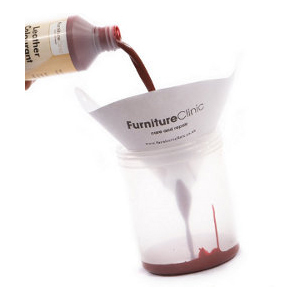 The PU Colourants have been designed for colour restoration and colour change jobs, so the pigment addition is very high allowing them to easily cover leather without the need for lots of applications. This item is made to order and is considered a customised product. 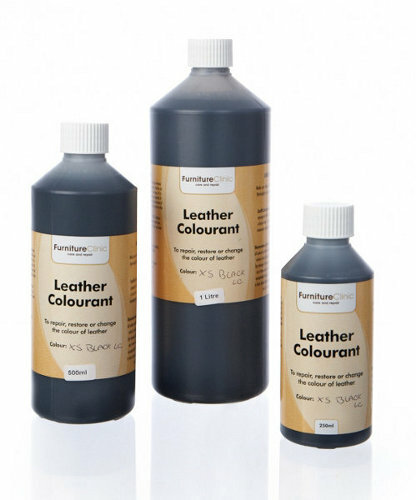 The PU Colourants are designed for restoring the colour and changing the colour of all leather items. The reason we recommend this colourant range over any other is the high rub fastness and scuff resistance characteristics: you will struggle to scuff or scratch them! The colour holds and will not fade, flake or peel, even after years of use. Not only are the colourants very hard wearing, but they also feel very soft and delicate (they will not dry out over the years), we've added controlled amounts of silicone into the base mixture to give it a lovely smooth and soft texture. 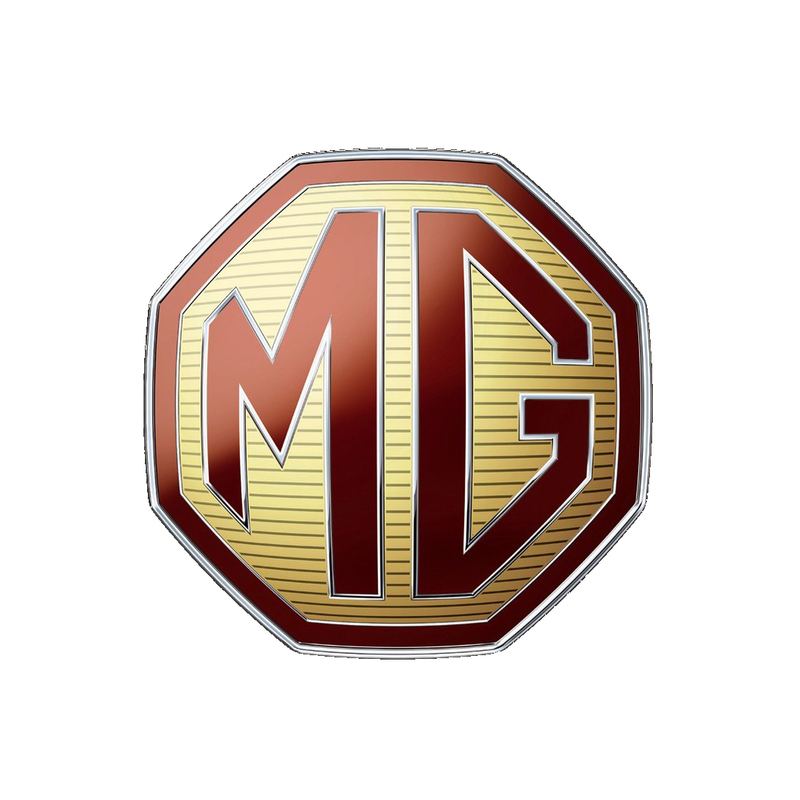 Originally developed to meet the high performance characteristics of the automotive market. 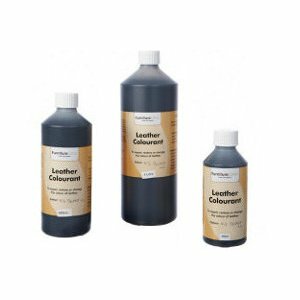 Before applying a colourant to a leather surface there may be necessary procedures and products to use to achieve a perfect and natural finish, and products to be applied afterwards for a strong and hard wearing coating. 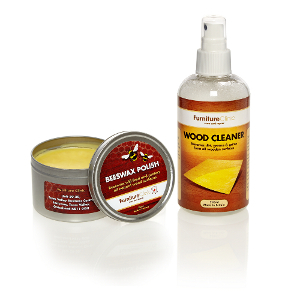 Clean the leather down with these two products before applying colour. The cleaning process removes dirt, grease, oils, waxes and silicones that unless removed could prevent adhesion. 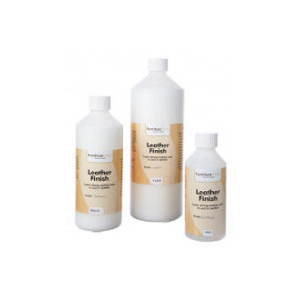 Sprayed onto the leather after colouring, this product will further add to the leathers scuff and scratch resistance. 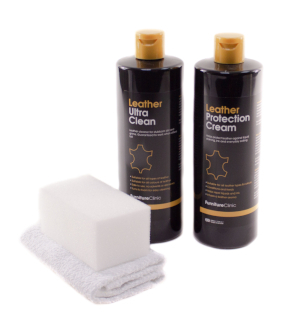 It also greatly improves the leathers rub fastness, feel and look. 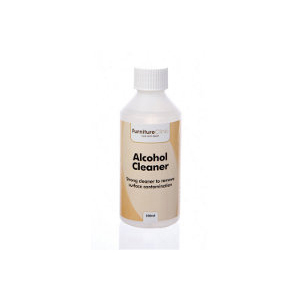 This product is also used to adjust the gloss level of the finish: available in matt and gloss. 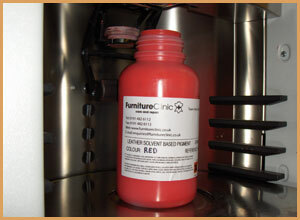 All the colours we supply are dispensed through our colour machine. 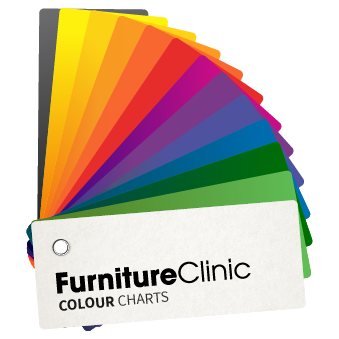 This ensures that every time you re-order a colour from us, weather it is a standard colour or matched for a small fee, that it is 100% accurate and representative of the previous colour. All colours are saved into a database, this means we can create a unique colour range for your company, so you can re-order the same colour again and again simply by quoting the reference number on the bottle. Database of over 10,000 custom colours to choose from. 16 base colours to use to mix and match any colour. Colour matching guide available. 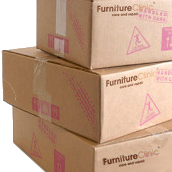 Furniture and automotive database of pre-mixed colours for many retailers and manufacturer's such as Argos, DFS, BMW and Mercedes. 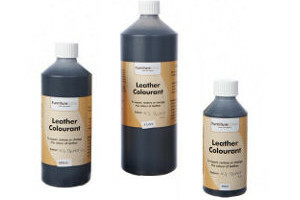 Wide range of pre-mixed standard colours to choose from; best suited if you are changing the colour of leather. Accurate colour matching available using the most advanced technology to date. 100% accurate every time - guaranteed! Same day colour match for next day delivery or same day collection. Adjustable gloss levels for a perfect match. Colour match to any sample of leather or material that represents a colour so long as it is larger than a postage stamp. We use 16 base colours, these base colours are primary, secondary and shade colours which can be mixed together to achieve any colour to match the leather being worked on. A colour matching guide is available to teach you how to mix and adjust colours. Additional support and guidance can also be given over the phone if required. Alternatively, we offer a wide range of pre-mixed colours as can be seen below. These colours are best suited when you are changing the colour of leather. If you try to use our Beige (bO2) from the samples below to fix a small area of colour loss on your beige leather sofa for example, the chance that our beige matches exactly the colour of your beige is very unlikely. This is because there are unlimited colours in the world, with millions of variations of beige. In this situation if you do not prefer to colour match the colour yourself, we have a very competitively priced colour matching service. Simply post us a sample of the leather. You can see where to get a sample from here. Whatever colour you need, we have a solution for you! The Ivory leather of my Stressless chair had developed an area of approx. 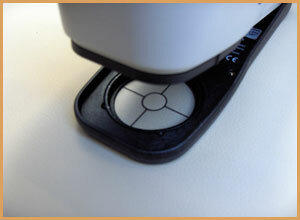 two square inches, centre front of the seat, where the top surface of the leather had disappeared. Your colourant plus the gloss finish have done an excellant job. I ordered a bespoke colour to be colour matched to my cream leather sofa. The colour was matched perfectly and it was done really quickly. My sofa looks as good as new. 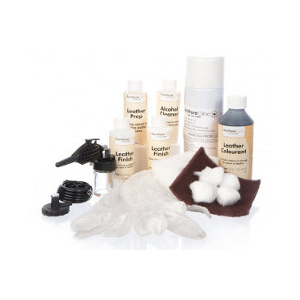 This can only be described as a fantastic product, we use it a lot for our restoration business and we have never had a single customer complaint.The dye sprays on very well and is quick to dry when heat is applied and it is very flexible once dried. Great product from a very good company many thanks to all at Furniture Clinic. This product is simply awesome. Spray with thin coats and do not try to make too thick coats. That's all. Over the moon with the results I got from this dye, my car is 54 years old and the leather was very tired and worn, but now it looks like new!! thanks verymuch, really simple to use.